The ladies county finals day was was hosted at Oxford City & County Bowls Club. 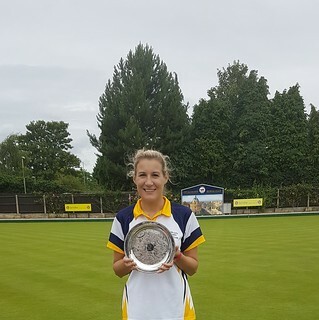 The ladies county singles championship was contested by current England singles champion, Donna Knight and England international, Katherine Hawes (both Oxford City & County). Hawes got off to a strong start taking an early 12 – 4 shot lead over Knight but Knight fought back scoring 6 ends without reply to take the lead. With the score standing at 20 – 13 to Knight, Hawes took it up to gear to bring the score to 20 – 17. In the final end, the head turned over with every bowl with Knight just managing to draw the shot to secure the title. The 2 wood was immediately played after the singles. Hawes took revenge by beating the newly crowned singles champion. Hawes was right on her game nailing the jack on most ends. Hawes took an early 11 – 3 shot lead after 9 ends but there was no time to recover for Knight who pulled it back to 13 – 8 after 16 ends but Hawes finished strongly and winning 15 – 10 at 19 ends. 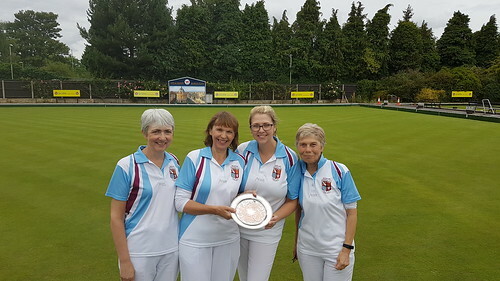 The fours final was a closely fought battle between Carole Galletly, Pam Shepherd, Helen Young and Caroline Campion (Banbury Central) and Maggie Miller, Sue Wilson, Jazz Alder and Karen Alder (West Witney). Campion’s four remained slightly ahead until the 15 end when Alder’s team went into the lead by 1 shot. Campion then scored for the next 3 ends giving them a 5 shot lead. Alder scored another single on the 20th end but Campion finished the game by picking up 1, winning 20 – 15. 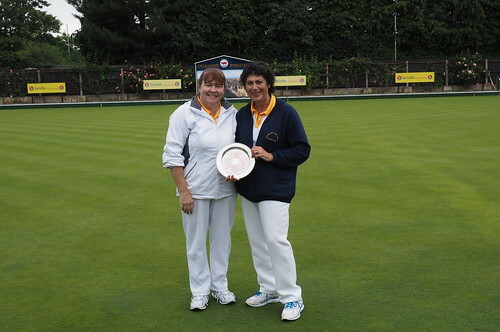 The unbadged pairs final was won by Barbara Singh and Sandra Grindrod (Witney Town). They beat Linda Coles and Adrienne Brown (Banbury Borough) comfortably. Singh and Grindrod raced to a 14 – 5 lead with Coles and Brown scoring a 2 and a 3 to take it to 14 – 8 but Singh and Grindrod replied with a 2 and a 1 of their own to push the game to 17 – 8. Coles and Brown picked up another single but conceed at 18 ends with the score at 17 – 9. The first game of the afternoon was the under 25 singles final between Jazz Alder (West Witney) and Katie Glenn (Watlington). Alder took a 6 – 2 lead but Glenn replied with a 2 and a single to keep the game close 6 – 5 to Alder. The two traded ends with Alder looking like she was going to push ahead by scoring a 3 to take the score to 11 – 8 but the game remained closely fought all the way through with Glenn managing to recover the 3 shots. Alder scored a string of ends to take the score to 20 – 12. Glenn picked up a single but Alder scored the final shot she needed to take the title 21 – 13. In the triples final, Knight and Hawes teamed up with Gail Gilkes to face Brigitta King, Sheila Oldham and Sheila Lovett (West Witney). The final was close all the way through until the 15th end with the score standing at 12 – 10. Hawes’ triple scored 3 ends in a row to win the title 19 – 10. The final game of the afternoon was the pairs between Karen Galloway and Carol Gaskins (Oxford City & County) and Myra Lewis and Helen Young (Banbury Central). At 8 ends the score stood at 9 – 7 to Lewis and Young. Galloway and Gaskins picked up a 2, a 4 and 2 singles to take a 15 – 9 lead at 12 ends. At 15 ends the score was 18 – 11 to Galloway and Gaskins. Lewis and Young made a come back to 1 shot behind at 18 ends. Galloway and Gaskins scored a 3 and a 2 to extend their lead to 23 – 17. Lewis and Young only managed to score a 2 on the final end with Galloway and Gaskins becoming the champions 23 – 19. First this week an update on the Gilkes after their car crash. Bob and his wife are now at home and making small steps towards recovery having suffered chest and trunk injuries from seat belt and airbags. They hope to be back at the bowls club as soon as possible. In the league, it was a week of close matches, even if the final scores seem to say otherwise. With Division 1 leaders Headington not playing, Watlington had the chance to narrow the gap between them. Whilst they did so, with a four – two win over City and County, this may not be enough to give them a realistic chance of the title. Indeed, should they drop points to Banbury Central this week and Headington win their match, at home to City and County, the title will have been decided. 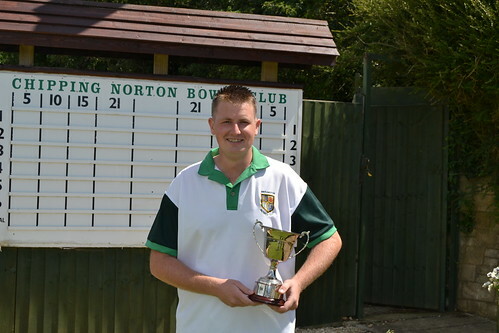 Watlington’s win was set up by Chris Gilkes’ twenty-three shots win. Whilst this more than cancelled Alan Leys impressive eighteen shot margin for City and County, it would have been even more decisive if, in the comeback of the season so far, Colin Pollard’s rink had not contrived to come from 23 – 9 down after sixteen ends to win the match 24 – 23 for City and County! The other fixtures in the division were more about relegation than winning titles. West Witney’s win at Carterton looks impressive at first glance but the rink scores show that Carterton were also fighting for their division one lives. Paul Sharman’s rink were ahead at eighteen ends only to drop a five to Andy McIntyre and be unable to recover; David Leighfield scored four shots in the last two ends to win his rinks whilst Paul Skidmore saved the best for the end being fifteen – five down after thirteen ends but then only dropping one more shot to win his rink by two. However, the real relegation battle was at Banbury Central were the home side need to beat strugglers South Oxford convincingly to have any chance of staying up themselves. Once Will Campion had gone fourteen – zero up on his rink, the rest of his teammates settled to the task with Mick Andrew drawing ahead in the second half of his game and Keith McNeil scrapping a last end win in a very tight match. Five points may yet be enough for Central giving what is still to come on the fixture list! In Division 2, leaders Kidlington defeated Chipping Norton comfortably, only Norman Sifford able to make an impression for the home side winning by thirteen shots. Whilst mathematically not yet sure of promotion, Kidlington could clinch this with their next match. Adderbury concocted a lifeline for themselves with a win at home to Shiplake, who showed their problems with travel distances fielding only fourteen players. Biggest win of the match was for Mike Jelfs’ rink who beat the opposition triple by fourteen shots. Division 3 remains as topsy-turvy as ever! This week’s matches saw Banbury Central involved in another odd result, this time to their disadvantage. Winning on two rinks and drawing a third proved insufficient to take the match points as Ken Williams rink won by twelve shots to clinch the match for Hanborough, doing so with an impressive second half to the game where they dropped only two shots. Both clubs now tie on points and are half a point behind second place Blackbird Leys whose comfortable win away at Bicester was down to solid bowling rather than any single rink winning by a large margin. Whilst the top four may think that they are fighting out the promotion places, Headington’s whitewash of Chadlington move them out of the relegation zone and, with three matches still to play, they remain close to the promotion dogfight. 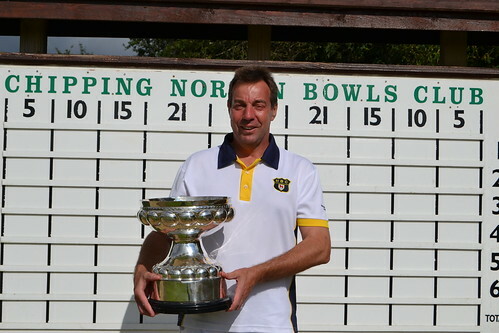 Martin Kershaw and Steve Gould skipped impressive victories for Headington with the latter taking the prize with a twenty shot win. Woodstock’s demolition of West Oxford was the outstanding match in Division 4. However, wins on all four rinks, including a twenty shot margin for Dave Francis’ men, and scoring a century in the process was still not enough to lift them off the bottom of the table! The other two matches appear to have been close affairs, indeed South Oxford’s win, at home to Oxford University Press was; David Bye’s twelve shot win cancelling Richard Cann’s ten shots for OUP. However, Thame’s defeat of City and County, whilst also four points to two, concluded with the home side scoring forty-four shots more than their opponents thanks to big wins for both Paul Heafey and Ray Plested’s men with the latter taking the star prize with their thirsty-three shot winning margin. 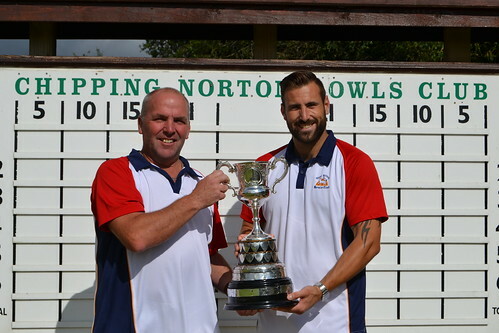 The Men’s OBA Finals day was hosted at Chipping Norton Bowling Club on Sunday with 6 finals played. The first game of the day was the two wood singles final between Watlington’s Sam Watts and Carterton’s Stuart Richens. A strong start by Richens gave him an early 7-2 lead before Watts fought back well to take it to 10 shots apiece after 14 ends. Playing the last end Watts picked up a crucial double to force an extra end. 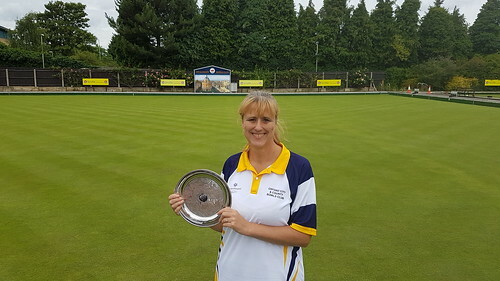 The extra end played and Watts delivered a fantastic second bowl to draw the jack and stay for a front toucher, with Richens narrowly missing the bowl which saw Watts be only the fourth name on the trophy since its inception in 2012. The second game of the morning was the under 25 singles between West Witney’s David Leighfield and Watlington’s Shane Cooper. A thoroughly strong performance from the start saw Cooper go 12 shots to 5 up early on before Leighfield got the score to 16-8 down, but 5 shots in 2 ends saw Cooper claim his first junior singles title on his last try due to retiring through age at the end of this season. The final game of the morning was an all Headington triples final between John Philpott, Nathan Lewis and Howard Watts against Colin Whitehead, Ray Gaskins and Nick Rae-Welsh. A good start from both sides saw the scoreboard at 9-5 in Rae-Welsh’s favour at 8 ends before 6 shots in quick succession stretched their lead further to 15-6 at 12 ends. Although winning 5 of the last 6 ends, it wasn’t enough for Watts and his men to catch up and they ended up losing 16 shots to 14 to Rae-Welsh and his triple. The presentation of trophies for the mornings winners were presented by President Bill Jarvie before lunch and snacks were enjoyed by all. The afternoon kicked off with the Singles final on the show rink in front of a packed crowd, between Banbury Borough’s Mark Sykes and Headington’s Ray Gaskins. A thoroughly enjoyable game to watch from start to conclusion saw world class bowling from both competitors. Sykes took a 16 shot to 13 lead before 7 shots were picked up by Gaskins in two of three ends to take the score to 20-18. Gaskins was holding game with two shots before a fantastic last bowl from Sykes see him clinch a single and another end to play. The final end saw Gaskins again holding with Sykes narrowly missing the offending wood and Gaskins winning 21 shots to 19. It has to be noted of the fantastic efforts by both in an intense and quality game of bowls. The penultimate game of the afternoon saw the fours final between Headington’s John Philpott, Nathan Lewis, Gary May and Howard Watts up against Carterton’s Tim Jupp, Gordon Walker, Steve Aldren and Stuart Richens. A 6 shot pickup on the first end set the Toon rink up well for the afternoon’s game. A great fight back from the Headington four saw the score drawing at 11 shots apiece at 11 ends before Carterton really ramped up the pressure picking up 7 shots to Headington’s 1 seeing the score reach 18-12 in Carterton’s favour. A second 6 shot pick up of the game for Carterton made it extremely difficult for the Headington rink to catch up and the overall score finished 27 shots to 13 to Carterton. The final game of the day saw Banbury Borough’s Darren Sharpe and A J Docherty against West Witney’s Will Parker and Kevin Alder. As they did in the semi-final, another strong start from the Witney bowlers saw them take an 11 shot to nil lead at 5 ends before the Borough pairing bowled well to get the score to 12 shots to 10 down at 11 ends. Unfortunately for the Borough lads, that was the last end they scored on as the Witney pair dominated in the second half seeing them pick up 17 shots and running out as 29 shots to 10 winners. Presentation of trophies for the afternoon’s winners by Bill Jarvie saw the day come to a close and what a fantastic day it was. A great day was put on by Chipping Norton Bowling Club with great facilities and catering provided throughout, so a big thanks to Roberta and her team of helpers for this. Another thank you goes to the two markers for the day, Ian Whelpton and Steve Witcombe and the umpire for the day, Tony Backer-Holst. The Bowls Oxforshire Ladies county finals will be held at Oxford City & County on Saturday 29th July. Refreshments available. The quarter finals were played on Saturday morning 22nd July at Oxford City and County BC in reasonable weather conditions until the last few ends when the heavens opened and the rain kicked in for the rest of the day. Myra Lewis and Helen Young (Banbury Central) played a closely fought game against Jan Gore and Caroline Bloomfield (Witney Town) but after being just one shot up after 17 ends, then went on to pick up 5 shots on the next three ends. They went into the last end 6 shots up and won the match conceding just one shot on the last end. Carole Galletly and Caroline Campion (Banbury Central) ran out the winners by 7 shots against Brigitte King and Sheila Oldham (West Witney) after racing away at the start of the game. Due to illness unfortunately, Maureen Cox and her partner (Kidlington) received a walk over to the semi final. Carol Gaskins and Karen Galloway raced ahead and Carole Thornhill and Roberta Jarvie (Chipping Norton) conceded after 18 ends. The semi finals, played in non stop rain, saw two very closely fought matches. 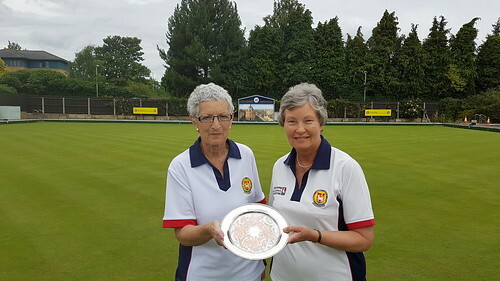 One between mother and daughter which ended drawn after 20 ends, with Helen Young and Myra Lewis winning a place in the Nationals at Leamington through with one shot on the last end. The other semi final Carol Gaskins and Karen Galloway with a place at Leamington with a two shot win. The Men’s Semi-Finals were played at Thame Bowling Club on Sunday 16th July, Monday 17th July and Tuesday 18th July. In the morning of the Sunday, a pair’s game, a triples game and a fours game were played, all battling for their spaces at Leamington for the national finals. The First game saw a rink from Headington of Bernie May, Mark Kirby, Shaun Claridge and Paul Mabbutt up against a Carterton rink consisting of Tim Jupp, Steve Aldren, Stuart Richens and skipped by Paul Sharman. This was a hugely tense battle throughout with neither side able to pull away. At 12 ends the score was 10 shots to 6 in Headington’s favour. Only 11 shots were scored over the next 7 ends meaning after 19 ends played it was all square at 13 shots apiece. Headington picked up a single shot to go one in front playing the last end. Carterton had the last bowl of the last end which forced an extra end to be played at 14 shots each. The extra end played and with Sharman’s first bowl to draw shot within inches, Mabbutt couldn’t replace it meaning the Toon rink qualified to Leamington, a second time for three of them in a week! The Second game saw a pair’s game between Banbury Borough’s Darren Sharpe and A J Docherty and Watlington youngsters Sam Watts and Chris Gilkes. At 10 ends the board was all square at 10 shots each, but the Borough lads pushed on well to pick 14 shots over the next 7 ends with the Watlington pairing only able to reply scoring 3 shots, taking the borough pair into a 22 shots to 12 lead. Watlington were only able to pick up another single shot before the game finished 25 shots to 13 in Banbury Borough’s favour. 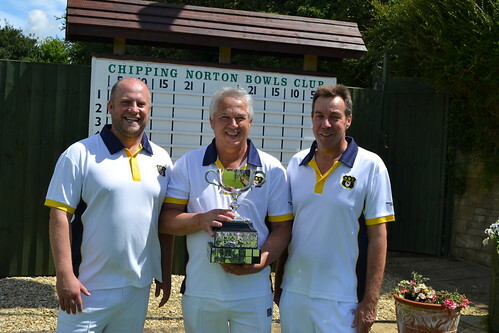 The third game saw a triples game between Headington’s Colin Whitehead, Ray Gaskins and Nick Rae-Welsh up against Woodstock’s triple comprising of Brian Clarke, Keith Comley and Paul Shipton. After 8 ends the game was very tight, with the score at 10 shots to 7 in Headington’s favour before a big push over the next four ends to pick up 12 shots to take the score to 22-7. The gap was too great to claw back for the Woodstock triple and they eventually lost out to Headington 25 shots to 13. Lunch was then greatly received by competitors and spectators alike before the afternoon games got underway. The first game of the afternoon was the second pair’s semi-final between West Witney’s Will Parker and Kevin Alder up against a Carterton pairing of Tim Jupp and Stuart Richens. The West Witney pair started strongly developing a 17 shots to 3 lead after 10 ends. From then on it was hard for either side to pick up a big shot count due to fantastic bowls played by all 4 players involved, with only 9 shots scored over the next 8 ends, taking the score to 19-10 in the Witney pair’s favour. A big count wasn’t made by the Toon boys which sent the West Witney pair through 24 shots to 10 victors and a maiden trip to Leamington for Kevin Alder to the national Finals. The Second game of the afternoon was a singles game between Headington club mates Nick Rae-Welsh and Ray Gaskins, who qualified with each other in the triples, no less than an hour before competing against each other. A close start saw the score at 11 shots to 10 in Gaskins’ favour, before he scored 6 shots to Rae-Welsh’s 2 to take him 17-11. 3 shots over the next 3 ends were scored by Rae-Welsh before Gaskins ran out as winner, 21 shots to 14 and two qualifications to Leamington in a single day. The final game saw the second fours semi-final between a Headington rink of John Philpott, Nathan Lewis, Gary May and Howard Watts up against a Watlington rink of Sam Watts, Adie Twinn, Steve Gilkes and skipped by Chris Gilkes. A solid start from the Watlington men took them 6-1 in front after just 3 ends before the Headington rink won 6 ends without reply taking a 13 shots to 6 lead at 9 ends. 10 shots scored between the rinks made the score 17-12 at 17 ends in Headington’s favour before they picked up 6 shots over the next three ends to take them through 23-12 victors and the final place on offer of the day to play in the national finals. On Monday night the second triples game was played between Carterton’s Stuart Richens, Robbie Clanfield and Baden Sparks against Headington’s triple of John Philpott, Nathan Lewis and Howard Watts. After a very even first 6 ends with both leads playing some excellent bowls with the shot changing hands bowl after bowl, the Headington triple then took control of the game by winning the next 4 ends scoring 11 shots without reply. 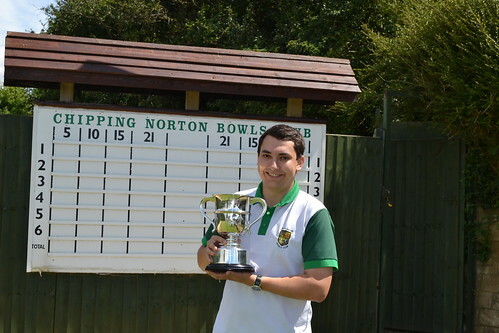 Despite winning 4 of the next 6 ends, Carterton could not make inroads into the lead Headington had established and they ran out winners with the overall score 20 shots to 13 to the Headington triple. On Tuesday night the second singles game was played between Banbury Borough’s Mark Sykes against Carterton’s Stuart Richens. After some first class bowling by Mark Sykes, he took an early 4-1 lead but with some excellent bowls, Stuart Richens fought back well to win the next 4 ends scoring 10 shots without reply. The next few ends were evenly contested until Mark picked up 6 shots in 2 ends to go 1 shot up. Stuart replied with 3 shots to go back in front, but then Mark scored 5 shots in the last 2 ends to run out as winner. The final score was 21-18 and what a first class game of Bowls it was. A big thank you to Thame Bowling Club for facilitating the semi-finals over the three days and providing excellent hospitality and catering throughout, it was enjoyed by all. Also a big thanks are in order to Ian Whelpton and Mike Petersen for assisting with marking singles games and officiating across the three days. 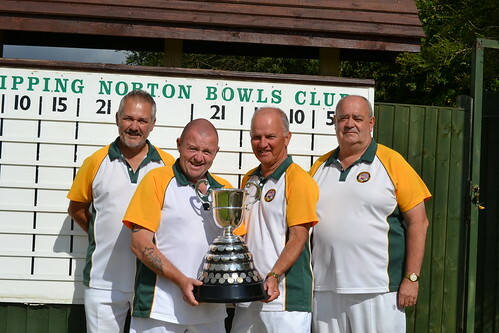 The OBA Finals will take place on Sunday 23rd July at Chipping Norton Bowling Club. 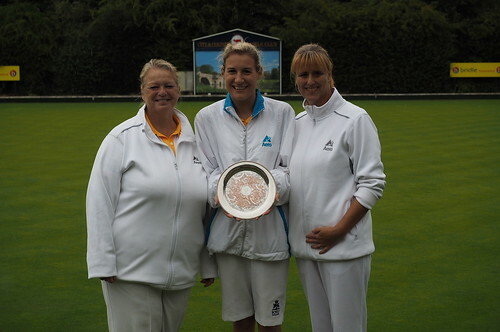 Bowls Oxfordshire Ladies beat Surrey at Banbury Chestnuts on Tuesday 18th July. 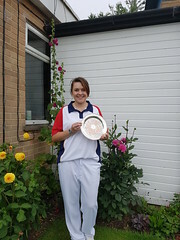 Terry Batt Rawden (Watlington) won the ladies unbadged singles played on Sunday 16th July at Oxford City and County BC. In a closely fought final Terry Batt Rawden came out the winner against Jazzmin Alder winning 19 shots to 15.